While the International Agriculture Salon gets into full swing in Paris, let’s take a quick look at the French context in which it is taking place. President Macron is opening the Salon, as have all French Presidents since de Gaulle, apart from Mitterrand, who openly disdained and mistrusted the farming community. Jacques Chirac went regularly, tucking into beer and choucroute with gusto while tickling cow bums; Nicolas Sarkozy went only to reveal his quick temper and foul mouth in the face of protesting farmers; President Hollande was whistled and accused of being insensitive to farmers’ plight (growing suicide rates, lack of financial support, emptying countryside). Last year as presidential candidate, Macron received a flying egg – uncooked – on his head from protesting farmers who were more than fed up with not being heard. He laughed it off, but it is to be noted that since then President Macron, once elected, lost little time in setting up the Estates General for Food which despite criticism have brought to the forefront the plight of farmers by tackling all relevant actors in the sector in order to understand and resolve the deepening problems. 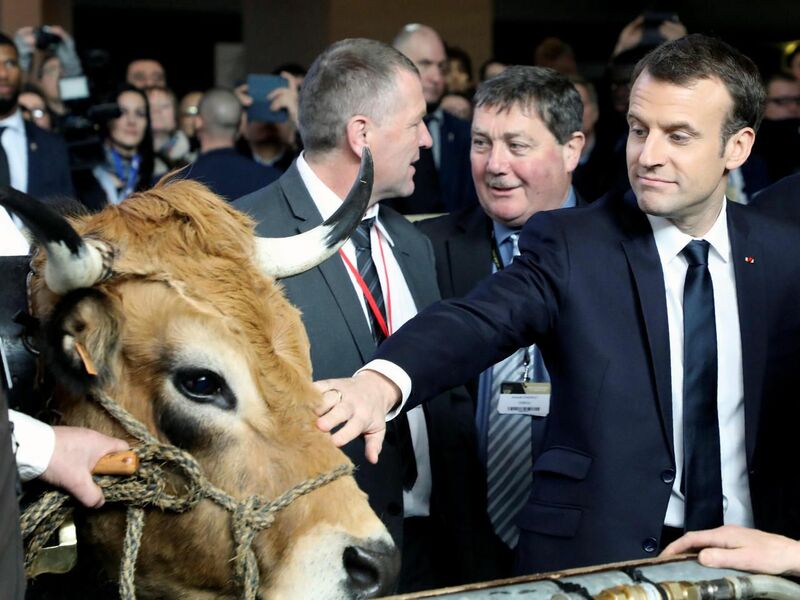 President Macron today at France’s international agricultural salon. Source: Le Parisien, Reuters Pool/Ludovic Marin. Macron’s tactic to invite young farmers to the Elysée Palace on Thursday 22 February, prior to the opening of the Salon, prepared the terrain for a smoother passage at the Salon itself. During his Elysée speech he praised the young farmers and encouraged them in their efforts to practise more modern, environmentally friendly farming methods. The President is determined to change French agriculture into a modern bio-based agriculture (as opposed to a chemically based one) for the rest of Europe to follow.. He was as much in praise of the increasing efforts made by young farmers to go bio as he was critical of farmers who resist change from the old chemical methods which have been in practice since the 1950s when they were strongly encouraged to produce as much as possible for a population recovering from the devastation of war. He has promised that the financial aid promised last year to bio farmers which still hasn’t materialised will be handed out by the end of March and that in the future such aid will always arrive “on time”. It is to be noted that bio-farming was already booming in France last year; more recent figures show that it is still soaring. 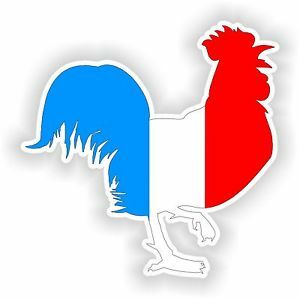 By the end of 2017, according to the French Agence Bio, there were more than 36,660 bio producers, 4,900 more than in 2016, a near 13.5% rise. Whereas Macron seems for the time-being to have won over most of the younger generation of farmers, the angry farmers’ brigade is still alive and kicking. Why? Firstly, habits die hard, and it is expensive to reconvert to new methods. Some farmers, once encouraged to buy huge tractors and material to work the land are now being told not to plough: turning the earth increases evaporation, the land subsequently dries up more and during heavy rains the rain can no longer penetrate, hence floods. The answer: cover, not plough. So they’ve invested for nothing. And some farmers may be losing their terrain. That is, if the proposed new map of exploitable areas, called zones défavorisées simples (often referred to as zones agricoles défavorisées) presented this week by the government, is to be upheld. 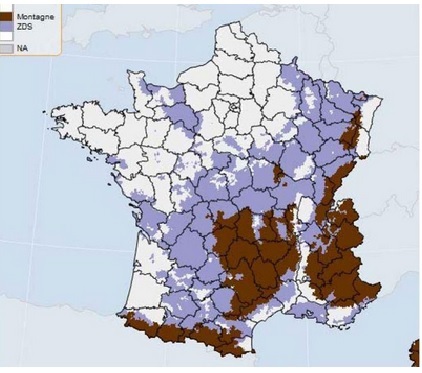 This new map shows that an extra 4,900 communes in France will no longer be able to farm their land, mostly because of climate change and other environmental factors. Farmers with land in these new zones will receive financial compensation. Farmers with land in the 1,349 zones that have been taken off the map will logically have their subsidies gradually taken away. News which has not been well received nor well perceived by those concerned. New proposed map of zones no longer exploitable for farmers. Brown areas refer to mountainous zones, shaded areas show other inexploitable zones due to climate change and other environmental factors. Picture captured from the website of the French Ministry for Agriculture . Another thorn in their flesh is Mercosur, the trade agreement between the EU and the South American countries of Brazil, Argentine, Paraguay and Uruguay, an agreement which puts the wind up most farmers who perceive it as a threat to the high agricultural standards that not only France is held to, but also Europe. Equally, they are up in arms against another trade agreement, the CETA (Comprehensive Economic and Trade Agreement) – still to be ratified – which could threaten the meat trade; Canadian farming does not adhere to the same standards of farming as those in Europe when it comes to pesticides and OGMs present in the bovine pastures. There is also the phasing out of glyphosate, which ‘traditional’ farmers find hard to swallow. And the list goes on. France is the biggest beneficiary of the CAP/Common Agricultural Policy and the most productive agricultural country in Europe. Between 2014 and 2020, 54 billion euros were given to French farmers in direct payments and more than 11 billion mobilised for the development of rural areas. This year the European Commission is reviewing the CAP to simplify and modernise it. The Commission says that this move is to ensure that farmers can earn a decent living, and to guarantee safe, stable and affordable food for all – echoing themes which came up in France’s Estates General for Food. According to a recently published EU Barometer report of public opinion on the CAP in Europe, almost three quarters (72%) agree the CAP is fulfilling its role in securing a stable supply of food in the EU, 64% think the CAP provides safe, healthy food of high quality and 62% think the CAP is ensuring a sustainable way to produce food. Almost as many (60%) think the CAP ensures reasonable food prices for consumers. PreviousWater: What are you drinking… really?